Synthetic Turf Athletic Fields built using AirField Systems AirDrain consistently outperform fields built over stone, concrete or asphalt, by reducing the Gmax and shock attenuation an average of 18.9% and 14.7%, and helps keep it there, for the life of the field. Multiple tests conducted by TSI Testing Services (an approved independent Test Laboratory by the Synthetic Turf Council) using ASTM F355-10a: Standard Test Methods for Shock-Absorbing Properties of Playing Surface Systems and Materials. 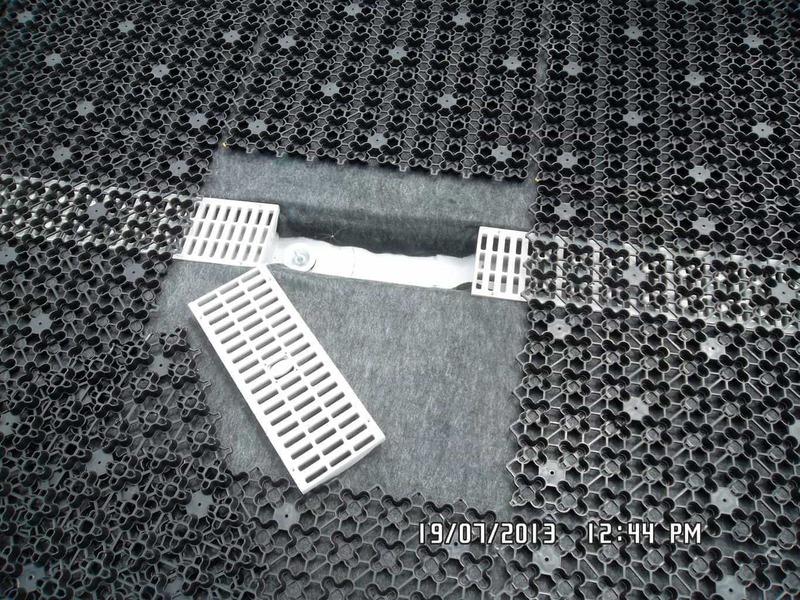 Gravel Subbase: with the use of the filter fabrics and AirDrain with infilled synthetic turf reduced Gmax attenuation by 18.9% versus Gmax attenuation which employed just the turf + infill system using the same sub base. Concrete Subbase: with the use of the filter fabrics and AirDrain with infilled synthetic turf reduced Gmax attenuation by 14.7 % versus Gmax attenuation which employed just the turf + infill system using the same sub base. The consistent Gmax and shock attenuation properties of AirDrain are a major contributor to the reduction of concussions and the safety of your players. Some factors that might influence a change in GMAX would be an inconsistency of the infill or wear of the synthetic turf fibers. Unlike traditional shock pads or e-layers the AirDrain is 1″ high, has a 92% air void and a vertical and lateral drainage rate which cannot be matched by any other product in the industry. See testing results conducted by TSI Testing Services below. Note: The above turf was selected from stock and its construction and infill properties are indicative a “typical” playing field for sports activity. TSi Accreditation: Our laboratory is accredited with US Dept of Commerce, National Institute of Standards and Technology: ISO/IEC 17025:2005. Our code # is NVLAP 100108-0. TSi is also recognized as an approved Independent Test Laboratory by the Synthetic Turf Council. However, it should be noted that some or all of the tests performed are not under our scope of accreditation due to the work not fully conforming to the standard, or it being outside the scope of our accreditation, or subcontracted. Uncertainty: We undertake all assignments for our clients on a best effort basis. Our findings and judgments are based on the information to us using the latest test methods available. Testing Atmosphere: Unless otherwise noted, all testing was conducted under standard lab conditions of 20± 2ºC and 65 ± 4% r.h.
Test Conditions: 61.5ºF 36% RH. Data obtained from this test method are indicative of cushioning properties of the playing surface system and materials under the specific conditions selected. The playing system is impacted at a specified velocity with a missile of given mass and geometry to determine the maximum value of G encountered during impact. The test set-up was positioned over the sub base with the clearview bumper II (gmax test equipment) placed level over the entire system. The missile was released, so as to impact the center of the assembly at a velocity of 3.43 m/s at a drop height of 24”. Three drops were made at 3 minute intervals. TThe procedure was repeated in three different locations for a total of nine drops. The first drop at each location was for assembly conditioning and was not included in the average. Conclusion: Use of the filter fabrics and AirDrain with infilled synthetic turf reduced Gmax attenuation 18.9% verses Gmax attenuation which employed just the turf + infill system using the same sub base. Test Conditions: 68ºF 42% RH. The test set-up was positioned over the sub base with the clearview bumper II (gmax test equipment) placed level over the entire system. The missile was released, so as to impact the center of the assembly at a velocity of 3.43 m/s at a drop height of 24”. Three drops were made at 3 minute intervals. This procedure was repeated in three different locations for a total of nine drops. The first drop at each location was for assembly conditioning and was not included in the average. Conclusion: Use of the filter fabrics and AirDrain with infilled synthetic turf reduced Gmax attenuation 14.7 % verses Gmax attenuation which employed just the turf + infill system using the same sub base.